Q. Is there a free issue I can view? A. You can read a free sample issue here. A. Signing up is fast and easy. Just click on the SUBSCRIBE button at the top right of the page. We charge by the month at $2.99 or by the year at $29.99, a savings of 17%. As long as your credit card remains valid, you need to take no action to keep your subscription current. We’ll alert you when your card expires; you’ll simply need to renew your card with us in order to maintain your subscription. Cancel your subscription anytime from your account. New issues go live on the first weekday of each month. Q. Can I give a gift subscription? A. Absolutely. Click on the SUBSCRIBE button and scroll below the monthly and annual subscription options. Q. What’s included in a subscription? A. 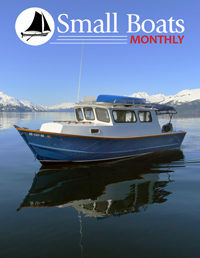 Your subscription to Small Boats Monthly will give you complete access to not only our current issue, but also to every issue we’ve already published. Your subscription includes Apps for iOS and Android! Keeping your subscription active will give you continuous access to our ever-growing archives—and to the current issue. A. We accept MasterCard, VISA, Discover, and American Express. Q. Do you have a print edition? A. Yes and no. Each December, we publish a print magazine called Small Boats. It’s available on the newsstand and through the WoodenBoat Store, and is a selection of the content you’ll find in Small Boats Monthly. 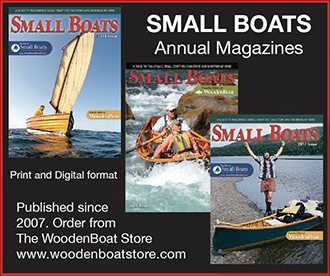 So, yes we publish a print magazine dedicated to small boats. But no, we do not publish a print replica of all of our monthly content. To have access to all of the content, you must subscribe. Q. Where do you find your stories? A. Our editors are passionate about all kinds of small boats, and are always seeking narrative pieces and boats for our profiles. We also rely upon our readers—our community—to keep us informed of developments in the world of small boats. These subjects might include new equipment and techniques for boating and camping, people taking interesting trips, new water trails, and surprising topics that we might not have dreamed of. If you have a suggestion for a story, please send an e-mail to Christopher Cunningham, Editor, at chris.cunningham@woodenboat.com. Q. How can I contribute an article to Small Boats Monthly? A. We welcome article proposals from our readers. Please review our Editorial Guidelines, which describe in detail what we’re seeking, and how to send it. You’re also welcome to email us your suggestions for articles; we’ll try to find a writer who can cover the topics you’re interested in. E-mail Christopher Cunningham, Editor, at chris.cunningham@woodenboat.com. Q. May I post comments and images on this site? A. Yes, you are welcome to post comments on articles, and our Classifieds section allows images. Please note: Posting copyrighted content without the permission of the copyright owner is not permitted. If copyrighted content is posted without permission, the copyright owner may contact us about the potential infringement, and request removal. Click “DMCA” (Digital Millennium Copyright Act) for information on getting in touch with the our DMCA Designated Agent to make a formal complaint. You can also find the Designated Agent in the Designated Agent Registry of the US Copyright Office. Q. Can I get a Small Boats Monthly T-shirt? A. Yes indeed, and in any color you want, as long as it’s black. 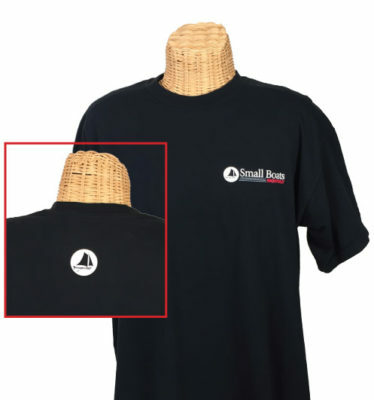 You’ll find our Special Edition T at the WoodenBoat Store, with easy, secure online ordering.